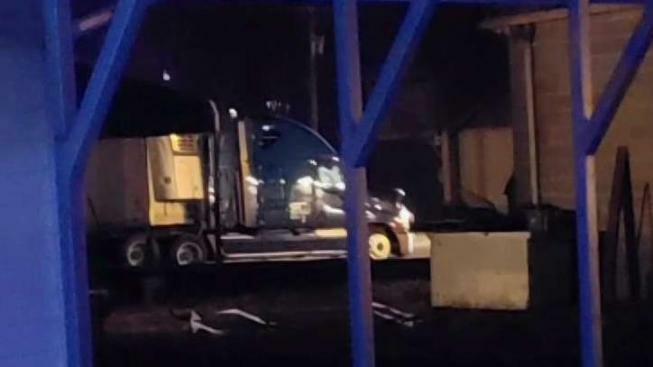 The driver of a tractor-trailer led authorities on a low-speed chase in rural Virginia Wednesday night that ended in an hours-long standoff and drug arrest, according to the Spotsylvania County Sheriff’s Office. About 7:15 p.m., a county resident reported the truck was parked in the 3200 block of Partlow Road. When sheriff’s deputies arrived, the driver, 51-year-old Muni Hussein of New York, took off, but not in a hurry. The deputies, assisted in the chase by state police, deployed spike trips to blow several tires, but the tractor-trailer didn’t stop until Hussein couldn’t handle a sharp turn in the area of Piney Branch Road at Catharpin Road, according to the sheriff’s office. But Hussein didn’t surrender. He holed up inside the sleeping area of the cab for hours, refusing to negotiate a peaceful surrender, the sheriff’s office said. Schember and other nearby residents were ordered into their homes. “It started with about three smoke bombs, and then after the smoke bombs they went to the flash bang, and then they had officers with guns pointed through front of the truck, and he still wouldn’t come out,” Schember said. Two SWAT team members finally climbed in to pull the driver out, witnesses said. Inside, authorities found the possible reason for the Hussein’s resistance. There was methamphetamine, and he allegedly was high. Neighbors who watched said that was the scariest part — a big rig driver with drugs on board. Hussein is charged with felony eluding, felony possession of methamphetamine, driving under the influence of drugs, refusal to submit to testing, failure to obey traffic signals and failure to turn on hazard lights while stopped in the roadway. He is being held without bond.